What do leprechauns do for a living? How do you make a leprechaun trap? Today’s Wonder of the Day was inspired by Totiyana. Totiyana Wonders, “What does a leprechaun do if you catch it?” Thanks for WONDERing with us, Totiyana! On St. Patrick's Day, you're likely to see plenty of leprechauns. These mythical creatures are the small fairy folk of Irish legends. They're traditionally portrayed as snappy dressers in green suits with hats and buckled shoes. Leprechauns are small. Some pictures show them tiny enough to sit on your shoulder, while others claim they're about the size of small children. Leprechauns are known to be practical jokers who love to play tricks on humans. Even though they're occasionally mischievous, they are intelligent creatures that are mostly harmless. Irish legends hold that leprechauns are shoemakers. They supposedly store all the gold coins they earn in a hidden pot of gold at the end of the rainbow. The legend of the pot of gold is popular, and many people have been known to chase rainbows in search of leprechauns and their gold. Supposedly, if you catch a leprechaun, he will grant you three wishes in return for his freedom. St. Patrick's Day festivities would not be complete without leprechauns, since they're known to be great musicians, too. Leprechauns can play a variety of traditional Irish instruments, such as tin whistles, the fiddle, and the Irish harp. The name leprechaun has an uncertain origin. Some believe it derives from the Old Irish words for “small" and “body." Others believe the term may have come from the Irish words for shoemaker. If you’re coming to Wonderopolis tomorrow, we hope you like your Wonder of the Day sunny side up! Ready to catch a leprechaun? Before you say "yes," you should know that it's no easy feat to catch a leprechaun. They're small and quite sneaky. That being said, we have confidence that you have the skill and brain power to catch one. Of course, the easiest way to do so is to build a leprechaun trap. If you want some tips on how to build a leprechaun trap, just check online. You'll find not only suggestions about materials to use, but also ways to entice leprechauns to your trap. Ask a friend or family member to help you build the best leprechaun trap possible! If you do succeed in catching a leprechaun, be very careful. A trapped leprechaun can be very wily. The Irish will tell you that it's best not to believe anything a leprechaun tells you. As you know, Irish legend has it that leprechauns will grant you three wishes in return for their freedom. However, many a leprechaun hunter has fallen prey to bad wishes and tricky leprechauns. To avoid such a fate, we think it would behoove you to think NOW about what three wishes you'd make if you're lucky enough to catch a leprechaun in your trap. As you think of wishes, also think about any bad consequences that could result from being granted those wishes. Do you believe all the Irish legends about leprechauns? Are they really that sneaky? Do they really play jokes and tricks on people? Pretend that you're a leprechaun advocate who has been hired to write a story that tells the story of the leprechaun from a new point of view. Can you craft a story that makes leprechauns look like nice, trustworthy creatures? Give it your best shot! When you're finished, share your story with a friend or family member. What do YOU think, Addie? What do YOU think, omar? Is the gold edible? If it is can I have some? What is the leprechauns gold made of? And i loved this artical. Leprechaun gold is made of magic and Wonder... and gold! We're glad that you liked this one, Aubree! Hi, Puplover1000! Leprechauns come from Irish legends. We would love to hear your thoughts about leprechauns! So leprechauns are real. In the video did they catch the leprechaun. Hi, Grace + Isabel! Leprechauns are from Irish legends. What else have you learned about leprechauns? This was a very rude comment to the people who actually BELIEVE in special traditions unlike you. Thanks for sharing your thoughts, Naruto. We do mention in the first paragraph that leprechauns are mythical and come from Irish legends. What are some other mythical creatures that you can think of? 😃 We think you may be interested in Wonder 162: What Is Pi? I think that the Leprechaun is real. After all, you just have to believe! 😊 Are you going to see any leprechauns on St. Patrick's Day, WonderopolisFan? Thanks for sharing your thoughts, too! This still dosen't anwser the wonder! I know right!it doesn’t answer are leprechauns real nether does the video! Hi, Isabella! what are your thoughts? Do you think they are real? Do you think leprechauns are real, Eric? Thanks for WONDERing with us! hi Wonderopolis i think leprechauns are real!!! Hi, Hannah! Thanks for sharing!! Have you ever caught a leprechaun?? Glad you liked this one, Luciano! Thanks for WONDERing with us! Hello,Wondetpoils... I was wondering... What is the actual truth abour leprechauns? We will leave that one up to you, HL409. What do you think? Thanks, Icyss! We think you are an awesome Wonder Friend. Wonder with us again soon! why is this wonder shorter than others? Probably because it was older. Some of our older Wonders of the Day might look a bit different from the standard ones we put out now. Thanks for asking! when did the leprechaun legends start? Sounds like a good question for a little more research! Let us know what you find out! Perhaps you do need a more effective trap. Good luck! You could probably still have it, we think. Maybe you're saying you would lose some of the magic? Thanks for sharing, HP. So you don't believe in leprechauns...do you believe in wizards? Aw thank you so much, AR69! We are just THRILLED that you are visiting every day and WONDERing with us. We love to have fun while learning new things so it's great to hear that you do too! Comment again soon! This is dumb. You should make one about guinea pigs. Sorry this on didn't grab your interest, Logan. You can submit a question about guinea pigs to our Wonder Bank. Thanks, friend! I don't think they are real. Probably not. But they are fun to Wonder about! Thanks for the feedback, KeiBurt! Some questions don't always have a crystal clear answer. And since we are WONDERopolis, we love to share the Wonder with you and hope that it inspires you to learn a little more on the topic. So in short, we kind of do that on purpose! Keep on WONDERing with us! i think leprechauns live in the irish land! That's a very scientific answer, Science man. Thanks for WONDERing with us! I heard they are not real, the smartest girl in my class, well me and her are on the same level but she said she believes in them. She is form India and also said leprechauns won't ever be in India. I didn't believe her. Great story! I think that leprechauns are real. Have you ever caught a leprechaun and wished three wishes? Tell me please? Thank you for your time. Sadly, no. If you got 3 wishes, Clyde, what would you wish for? That's wild! Where did you see the footprint, Rhonda? I'm wondering if lepreachauns are really real! In my opinion, I think leprechauns are real. really? did you take a picture?!!!!!!!!!!! Right now, there are 236 leprechauns that live in the carverns of Carlington Mountain. They are protected by European law and by the EU. Any wish will come true because if it does I want to go catch one right now and are they still around in April I hope they are. I am Irish are you? I love this video And I think the little boy is so cute! I love the way he decorated the trap. I hope they caught a leprechaun and I can't wait to see if he will make another video for us! That's a tough one, HamsterLover409. Maybe you need to try a different trapping method? Anyway, I guessed it right without reading it. The answer is NO because I asked my dad to find the end of the rainbow, but my dad said the leprechaun IS NOT REALLY REAL. On the video, did the people catch a leprechaun? Have a happy day!!!!!! Hi, I was wondering, since it never said Leprechauns were real, if they really are real. Because I don't want to waste time on building a trap that my mom is going to make it look like there was a leprechaun. What are leprechauns? Are leprechauns real? I saw one and they do rock Andrew!!!!! Whoa that was super awesome!!!!!!!!!!!!!!!!!!!!!!!!!!!!!!!!!!!!!!!!!!!!!!!!!!!!!!!!!!!!!!!!!!!!!!!!!!!!!!!!!!!!!!!!!!!!!!!!!!!!!!!!!!!!!!!!!!!!!!!!!!!!!!!!!!!!!!!!!!!!!!!!!!!!!!!!!!!!!!!!!!!!!!!!!!!!!!!!!!!!!!!!!!!!!!!!!!!!!!!!!!!!!!!!!!!! That is like, the cutest thing EVER!!!! Hi, my name is Kenny. I'm Mady's cousin. I'm the good lucking looking one!!!!!!!!!!!!! Totally she's catching up. Me and Avery (you know Avery) made a fairy burrito and they ate it. Fairy's are real!!!!!!!!!!!! I want a leprechaun for a pet. Oh, and awesome leprechaun trap!!!!!!!!!!!!!!! Hi wonderopolis,my name is mady and I have a lerechaun house in my front yard,It so cool!!!!!!!!!!!!!!!!!!!!!!!!!!!!!!!!!!!!!!!!!!!!!!!!!!!!!!!!!!!!!!!!!!!!!!!!!!!!!!!!!!!!!!!!!!!!!!!!!!!!!!!!!!!!!!!!!!!!!!!!!!!!!!!!!!!!!!!!!!!!!!!!!!!!!!!!!!!!!!!!!!!!!!!!!!!!!!!!!!!!!!!!!!!!!!!!!!!!!!!!!!!!!!!!!!!!!!!!!!!!!!!!!!!!!!!!!!!!!!!!!!!!!!!!!!!!!!!!!!!!!!!!!!!!!!!!!!!!!!!!!!!!!!!!!!!!!!!!!!!!!!!!!!!!!!!!!!!!!!!!!!!!!!!!!!!!!!!!!!!!!!!!!!!!!! Wow!! Leprechauns now have me thinking!!!! They're very small devious little people!! I have the best times on St. Patrick's day!! There are always weird things happening to me!! Like, for example, last year on St. Patrick's day at school my class and I were sitting and watching something on the TV, and then the TV just turned off by itself!! It NEVER does that... Anyway throughout the day, the door kept opening and closing. After everyone was a bit paranoid. People kept shouting "OH NO!! LEPRECHAUNS!!" Do you have any idea why on St. Patrick's day if you don't wear green, you get pinched?? I always wear green to be on the safe side.... :) Thanks SO much for all these AMAZING topics and articles!! Can't wait to read more!!!!!! Hi Wonderopolis, I'm Avery and I loved your article! My class is making a Desertoplis. Guess what? My friends, Lena, Seif, and I made a leprechaun house yesterday. It was so fun! Oh and HAPPY ST.PATRICK' DAY!!!!!!!! I love leprechauns. They have to be real or why would there be a St. Patrick's Day?????? I thought this Wonder was really cool. Today my leprechauns made us cookies and gave us onions. I think they just gave us onions for a trick. Do you still believe in leprechauns? I love today, wonderopolis. I love st patrick's day because my friend named madison's birthday IS ON ST PATRICK'S DAY. Thank you for teaching me about leprechauns. I am going to try to make leprechaun trap with my dad now. Have a wondering saint patrick's day. 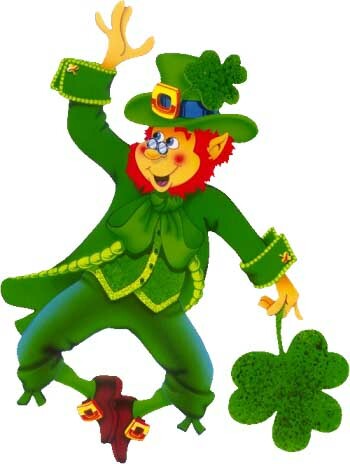 Leprechauns are mythical creatures associated with legends from which country? Irish legends hold that leprechauns are what? On which holiday would you most likely see a lot of leprechauns? aNew Year's Day Not Quite!